As part of Proboscis ongoing creative research partnership with Waterloo, Canada based RENDER, Alice was commissioned to develop a new work specifically for the atrium of the University of Waterloo School of Architecture in Cambridge. Combining new media and traditional methods, the project reflects the Proboscis strategy of engaging the social, cultural and natural histories of specific sites and territories. Alice brought interest in rivers as life-lines, connectors and definers of place that has grown out of her long term work on Topographies and Tales. For this project she, and RENDER Director and artist Andrew Hunter, explored the Grand River from its mouth at Port Maitland on Lake Erie to Elora. By bicycle, car, foot and kayak, they wandered through and around the numerous cities, towns, villages, communities, farm fields and industrial sites the river penetrates, defines and skirts, making focussed stops along the way at Chiefswood National Historic Site, Paris, Galt and Kitchener. 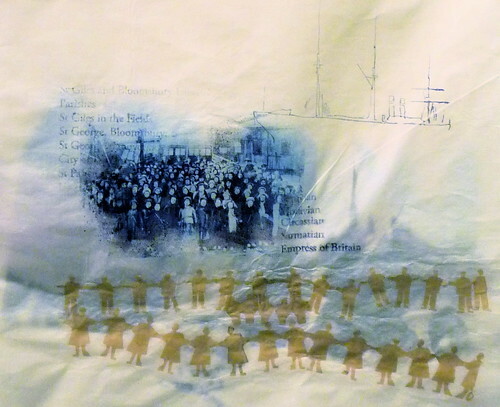 Alice’s inquiries have also taken her to libraries, museums and archives and into conversations with numerous individuals whose lives have been touched by the river. The resulting work is a personal and poetic reflection on a significant body of water whose role as a critical thread through the region is often forgotten or obscured by more recent grids of development, pathways of transportation and community boundaries. 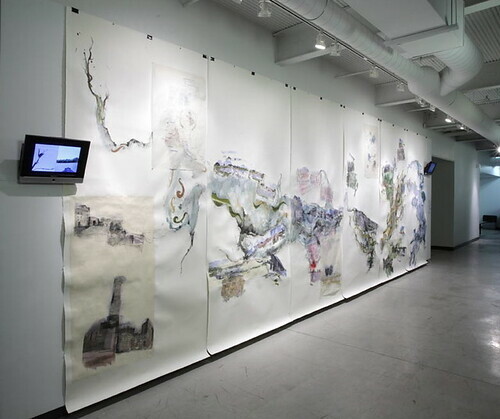 As with her other work At The Waters Edge: Grand River Sketches maps a dialogue between the artist and place emphasizing a process of inquiry. At the heart of RENDER’s ongoing collaboration with Proboscis is creative research grounded in local history and the built environment. Past collaborative projects have included Anarchaeology and The Accidental Menagerie. At the Water’s Edge will be further developed into a publication and Proboscis will play a central role in RENDER’s upcoming GROUNDWORK community garden project at rare. Proboscis and RENDER would like to thank Robert McNair (UW School of Architecture), Paula Whitlowe (Chiefswood National Historic Site) and Joyce Majiski and Tuktu Studio in Whitehorse (where Alice spent a week working on At The Water’s Edge) for their support of, and contributions to, this project.